I entitled this blog post “Electric Water Kettles” for a very specific reason. I do not ever want any of you associating the word “tea” with an electric kettle because you CANNOT put tea in the kettle! It is only for water. This should make sense if you are used to making tea the old-fashioned way; boil water in a kettle on the stove, pour it into a teapot, and then steep your tea in it. A teapot is usually made of ceramic or porcelain, and I would hope that it goes without saying that a teapot cannot go on your stove top to boil water in. There is, however, an electric device you can both brew and steep tea in if you really want to, but it’s a tad on the spendy side. It’s called the Fine T Machine and it has several settings for a variety of tea types and works extremely well (I used one heavily at one point, even producing multiple batches for a tea tasting), so worth every penny! 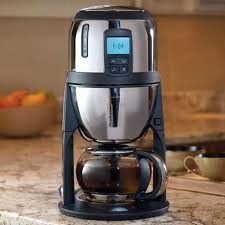 I also just discovered that Breville has come out with a nifty looking machine they call the One-Touch Tea Maker. I’d love to hear your reviews if you’ve used this since they are usually a good brand name. 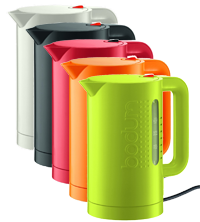 Bodum electric kettle is the best!! 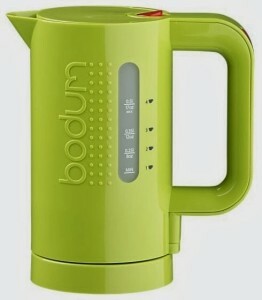 As for your basic electric water kettle, hands-down the longest-lasting brand I’ve ever seen in action is the Bodum. These very rarely ever got returned (actually, we could hardly keep them on the shelves because we sold so many! ), and the stores we worked in owned these and used them extremely heavily and they were all some of the original models, still perfectly functioning many years later. They’ve since improved the design a tad by making the power switch stronger and the connection to the base more durable and simpler to latch. I know the thought of using plastic alarms a lot of folks, particularly with boiling water. First of all, Bodum products are BPA-free. Secondly, as I explain in my BPA blog, the temperature needs to be extremely hot or else whatever going in needs to be highly acidic for there to be any leaching. Boiling point is not nearly what sanitize mode is in your dishwasher! 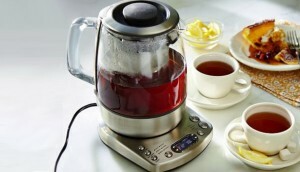 And lastly, all electric kettles have plastic on the lid, handle and base. If they are glass, there could also be “metal” handles or lids which are usually a thin metallic film painted over plastic that will eventually start peeling off. If you prefer the glass (especially because they do look a little more elegant than Bodum’s modern design), my next pick will always be Chef’s Choice. Another solid brand name, the kettles always seem to last a lot longer than other selections. 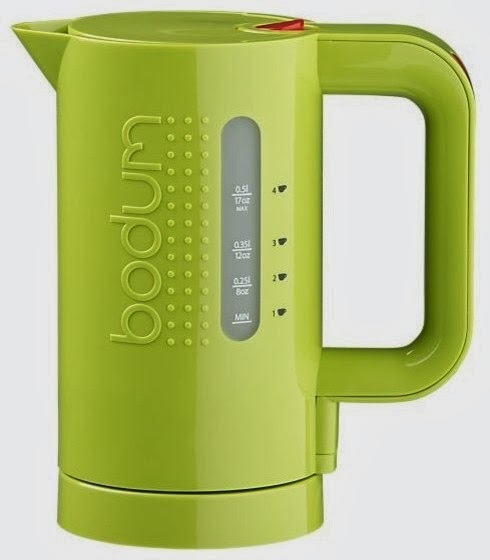 Now that I just wrote all of that, of course Bodum has come out with a model that is mostly glass, similar to other glass electric kettle models (I swear, click the link, it says “new” over the image! :P) I used to like the Capresso, but as I mentioned in the coffee maker blog, they’ve outsourced to China and the quality of the brand is diminishing a little. I’d say it’s hit or miss if you buy one. Chef’s Choice also makes a couple of stainless steel models that I would also highly recommend. 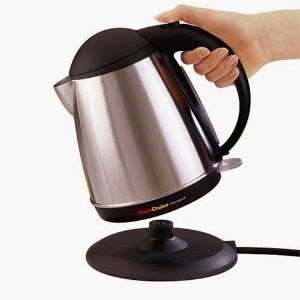 The great thing about all of these kettles nowadays is that they are “cordless”– they detach from the base so you can walk around and pour without a cord getting in your way! They also mostly all have auto shut-off, which is just fabulous. You can find some electric kettles that have temperature settings, as well. I’m sure Proctor-Silex and Delonghi are solid enough machines, and of course Breville has a good brand reputation. Share your thoughts with us if you’ve had experience with an electric kettle you love or dislike! Figured this is worth mentioning: Temp specific is nice if you are going to do any kind of pour over or full immersion coffee brewing (Hario, Chemex, etc) and for more delicate tea blends that shouldn’t be scorched. I have the Oster Variable temp. Newest model looks a bit different, but can dial in temp from 110-212. Don’t know about consumer reviews/defects but this one gets used everyday and its still kickin. Great tip I almost forgot about those! Although I have to say super serious tea drinkers have never been impressed with the ones I’ve sold in the past, haha. 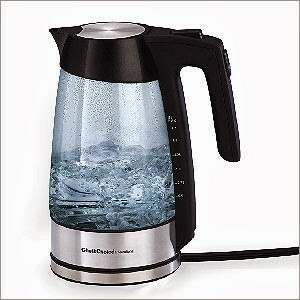 For me, with an electric kettle the water is always too hot, so I wouldn’t know the difference!! PS Great blog. Keep it comin! They don’t let us keep them at work anymore so it doesn’t get used as much but I love my little red Bodum!